then 10 minutes walk from Grantham station ! Grantham Station is a little over one hour by train from London`s King`s Cross (see further details below if travelling by car). Grantham Station also provides convenient rail connections with most of the British Isles. Michael`s highly acclaimed national, and international practice (Elevated Therapy) is just over 10 minutes walk from Grantham Station. When you arrive and come out of Grantham Station turn left and proceed to top of Station Road. Turn right onto A52 / Wharf Road passing the Isaac Newton Centre and Bus Station after a couple of minutes on your left. 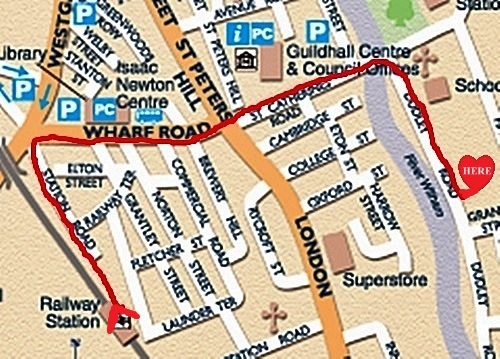 Keep going straight ahead onto St. Catherines Road with the Town Centre and Wetherspoon`s Tollemache Inn on your left. You will then pass “The Reel Cinema” also on your left going downhill. Lots of building work happening here. Keep going and then walk over the little bridge of the River Witham. Cross over to the right-hand side of the road if you have not already done so. Turn right onto Dudley Road (there`s an old red post box on the corner there), and only a short distance down, “Tipperary House” is located on the left-hand side of the street. [Number 21] There are large open wrought-iron gates, and a tall flag-pole in the front garden beside the drive-way coming in. Grantham is a major station with taxis usually available on a rank outside. Advance booking is not normally necessary unless arriving early in the morning or late at night. Operators who accept bookings are Grantham Taxis on 07976 970 694 and 01476 594594 / 591059. Grantham is a little over two hours by road from London. 1) Take the A1 heading North all the way. 2) Exit onto B1174 toward Grantham/Boston/A52/Sleaford/A153. (South Parade). 3) Turn right onto Bridge End Road / A52. 4) Turn left onto Harrowby Road. 6) Turn right onto Dudley Road. (Lord Harrowby Pub is on left corner). You will notice a tall flag-pole in the front garden with large open wrought-iron gates to the driveway, and there is off-street parking if you wish if you don’t find immediate parking to hand as you can park on Dudley Road itself. Driving in from the A1 from London, and the South. Shopping in Grantham: Clients visiting “Elevated Therapy” in Grantham may wish to avail of the local shopping and services here before returning home. Everything is within 10 minutes walking distance of the practice which includes the Post Office, all the major banks and many nationwide shops like Rymans, Dorothy Perkins, Boots, Argos, Laura Ashley, Clinton Cards, W H Smiths, M & S, Next, Dunelm Mill etc. There are also some interesting `Charity Shops` too and `specialist` and Antique Shops and the major supermarkets are represented here also. There are some lovely restaurants, places for coffee and a drink or two as well ! As many of you know, especially from London and the South-East – it takes forever to get these jobs done as establishments can be scattered all over the place with long queues. It can also take ages to travel from one place to another. Everything is close together here in Grantham making the whole job easier and very often, much cheaper as well !! Customer Service is good and people are very warm and friendly. For international clients flying into East Midlands Airport, you can take the Skylink bus from the airport towards Leicester and get off at Loughborough, Swan Street. 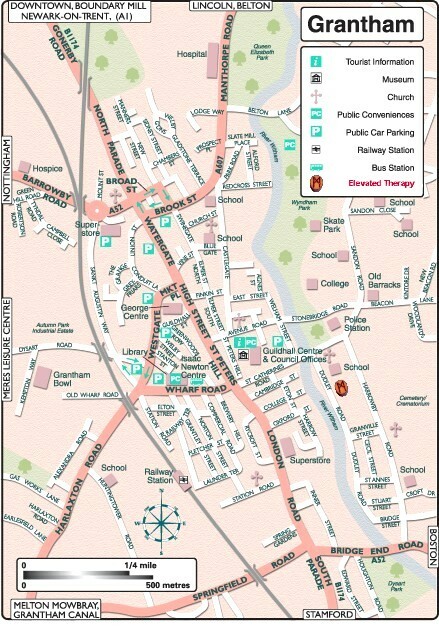 Then take the bus from Loughborough`s Baxter Gate to Grantham Bus Station on Wharf Road. Michael`s practice is just over 5 minutes walk from here (see map above). You could also get the Skylink Bus from the airport to the City of Nottingham and get off at Nottingham Station, Stop S6 (on Carrington Street) and walk to Nottingham Railway Station which is about 9 minutes walk away from there and get the fast train to Grantham. Clients using Heathrow, Gatwick, Stansted, Birmingham and other UK airports – please contact Michael by email for help with getting here. Michael also recommends a professional chauffeur company for discerning clients based in Nottingham / Grantham offering an executive travel service developed to meet a broad range of individual, group or corporate requirements. The service includes airport departures and arrivals and executive journeys to and from hotels, ports, stations, private airports and business meetings throughout the UK. Please contact Roger on 0800 0149 222 / 0115 899 0410 or visit the → website.